This is stamped on the back of every bill. To avoid a lien being placed on your property, it is important to stay current on paying your sewer bill. The card with the first billing of the year will state any unpaid balance from the previous year. The card will also be stamped with a date that the unpaid balance must be paid by in order to not receive a Demand for Payment. At the end of January, a 10-Day Notice for Claim of Lien and Demand for Payment is sent out if the balance is unpaid. In February, liens are placed on properties that have over a $200 unpaid balance from the previous year. In November, notices are sent out to property owners that have an unpaid balance on the lien. These notices state that the property owner has 90 days to pay the lien balance. In February, 12 months after the liens have been placed, there is automatic foreclosure on all unpaid liens. Stamped on the first bill of the year, if there is an unpaid balance from the previous year. The date that the Demand for Payment is sent out is written on it. 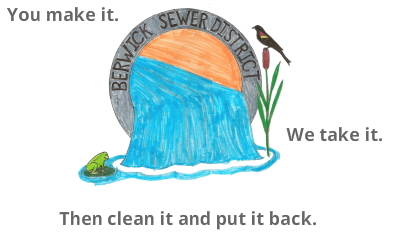 It is important to note that the sewer bill stays in your name, regardless of who is residing at the property. To ensure payment of the sewer bill, we highly advise the landlord to pay the bill or collect the money directly from the tenant and pay the bill. If the tenant fails to pay the bill, a lien will be placed on the property in the legal owner's name.